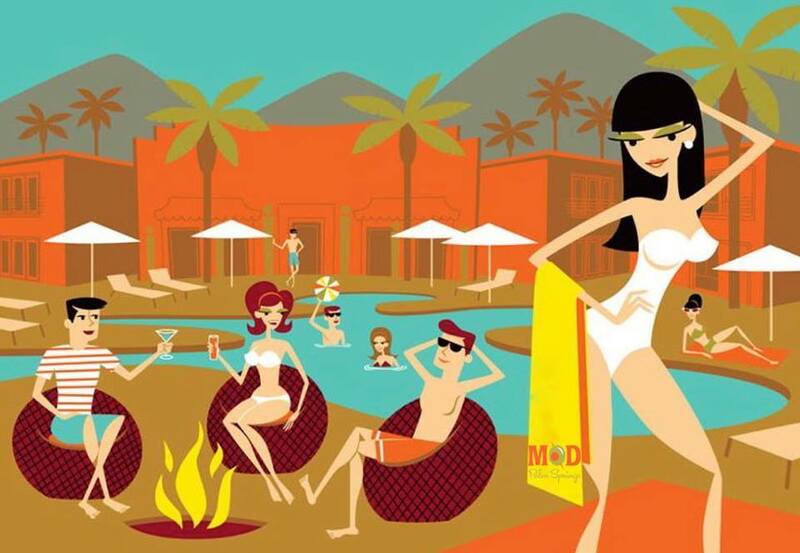 The second annual MOD Palm Springs event was held on 9-13 October 2014 as a celebration of mid-century modern and retro-Tiki culture. The MOD Palm Springs 2014 event featured a vintage fashion show by Deja Vu, lectures on mid-century modern, DJs, cocktails, a room crawl, tiki boutique vendors, and special events featuring Shag. The event was organised by Tiki Caliente and The Shag Store and hosted again at the Curve Hotel. An advertising postcard for the MOD Palm Springs 2014 event was given out free at The Shag Store. MOD Palm Springs advertising picture based on the 2013 print ‘Riviera Retreat‘. People staying over at the Curve hotel for the weekend received a limited-edition pendant instead of the attendee wristband. The public voted on the final colour to be used for the on-ground pendant and orange was selected. The Tiki pendant is sized 2.75” x 1”, with a leather rope necklace, and etching on the back. Note that the brown version was later released as an open edition. MOD Palm Springs 2014 glasses and coffee mugs ($15 USD each) were also for sale at the event. Josh Agle released a new serigraph print named ‘The Idolator’ during the weekend event. This 16-colour hand-pulled unframed serigraph print is sized 19.5″ x 19″ (50cm x 48cm) and cost $225 USD. The 55th Annual Cocktail Climb was a ticketed cocktail party hosted by Shag during MOD Palm Springs 2014 at the iconic Palm Springs Aerial Tramway. This Shag cocktail party was held from 2pm until 5:30pm on Saturday 11th October 2014, cost $99 USD, and was the inaugural “climb” based on Shag’s print. Included was a round-trip coach ride to the tramway, a return tramway lift ticket, a visit to SHAG the store, two speciality cocktails and a limited-edition (100 only) blue tramway cloisonné pin. Note that the pin was re-issued in red, orange and white as an open issue. A 2014 giant Tiki head man was present at the event drinking cocktails and posing for photographs. The official MOD Palm Springs 2014 mug was sculpted and manufactured by John Mulder at Eekum Bookum in a limited edition of 150 pieces. Note that the 2014 mug was released in orange and then re-issued in lime green for the 2015 MOD Palm Springs event in a limited edition of 50 pieces. The mug is sized 7.5” high (19cm) and has a capacity of 16 fl. oz. Tiki mug collector organisation site Ooga-Mooga! describes the MOD Palm Springs 2014 mug as “This is an orange mug shaped like a Moai. It is covered in a repeating tapa print with smaller Moai heads and other varied images”. The site also lists the average price for the mug at $152 USD (up from an original cost of $115 USD).